One of the most conspicuous activities in the preparation for the monsoons in several cities today is dug up roads ! 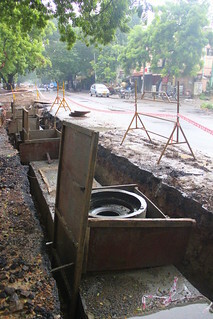 Crores and crores are spent on the construction of storm water drains alongside roads in cities and towns to prevent flooding during the rains. These channels / tunnels, that stretch for several kilometers, winding its way across the city, are expected to channel all the collected water into the nearest water body, say a lake or a river. The Rain Centre, Chennai, managed by the Akash Ganga Trust is the first of its kind in the country. It serves as a one-stop information and assistance centre on rainwater harvesting and ecological sanitation. Resource persons associated with the Centre take time out to create awareness on urban water management and to spread the word amongst the public. The Centre also provides assistance to residents who wish to install rainwater harvesting and sustainable sanitation systems in their homes. Upon request, they also conduct studies to assess the feasibility of installing such urban water management systems in a particular area. The Centre does not charge any fees for the services it offers. Storm water drains: Final destination ? Corporations and local bodies in towns and cities across the country have invested a great deal on time and money in the construction of storm water drains in a bid to ‘catch’ the rainwater as long as the downpour lasts. But what ultimately happens to all the collected water ? The Centre has, in the past, forwarded several recommendations to the Chennai City Corporation on how best the water collected from storm water drains in the city, can be used. In particular, they have been exploring if the rainwater collected through these drains (which is currently being wasted) can be used to recharge groundwater instead, and are keen to gather the opinion of citizens on this matter. The Tamil Nadu government had enacted a law in October 2002 and followed it with an ordinance in June 2003, making rainwater harvesting compulsory in all existing buildings not only in Chennai but in the entire state and the same to be complied with, by October 11, 2003. This was at the micro level and as per the then release of the government in November, 99.5% of Chennai’s residents had implemented rainwater harvesting (RWH) in their respective houses/flat complexes. However a survey conducted by the Rain Centre, in one residential colony during October to November 2003 revealed that fifty percent of the residents had done it unsatisfactorily. Even among those, who had done it correctly, had done only rooftop harvesting and had completely ignored the rainwater falling all around the built-up area and running off to the street through the gate(s). They had failed to realize that rainwater falling all around the premises, though unfit for direct collection and use, is still good for ingesting into the soil for recharging and replenishing the groundwater source. This surface runoff, in fact amounts to twice or more of the rooftop collection, particularly in apartment complexes. While the society has done their bit, to protect the precious groundwater source, it is now upto the government to play its role in helping the society to further enhance the groundwater storage by harvesting the rainwater that falls in public places such as roads, parks, playgrounds etc. What is presently happening to all the rainwater that is falling in such places, is that it is collected in storm water drains constructed either on one side or on both sides of most of the roads in Chennai and discharged into the Bay of Bengal through the city’s waterways. Thus, a large quantity of rainwater is wasted every year without being ingested into the soil to replenish the “already dry” groundwater source. As mentioned above, the urban runoff water is definitely fit for ingesting into the soil. Any bacteriological and chemical contaminants that it may contain would get completely filtered when such ingested water percolates down and moves laterally in the soil. Harvesting urban runoff essentially boils down to ensuring that the rainwater that flows in the storm water drains during rainy days is efficiently ingested into the soil. In places, where there are no storm water drains, problems of stagnation and subsequent flooding should be prevented by leaving sufficient open space on both sides of the road or cured by suitably discharging the stagnant water into recharge structures constructed within private or public premises. No doubt, this water will carry along with it large quantity of solid waste, besides fine silt and will pose as a major hurdle in harvesting and hence will have to be handled with care. Rainwater structures that should be constructed should take into account this hurdle. The best structures for such purposes are recharge wells and not recharge pits. While the former can be desilted easily and kept efficient for percolation, the latter cannot be desilted and once if they get clogged will have to be abandoned. This is precisely what has happened in G.N.Chetty Road, T.Nagar, where several such pits were constructed a couple of years back. Identify drains, which are free of any domestic sewage. Amongst them, take up those drains, which are located close to large open spaces. For example, Sardar Patel Road between I.I.T. Gate and Raj Bhavan, Beach Road from All India Radio to Napier Bridge, the road adjoining Loyola College, Women’s Christian College, Stella Maris College, Pachaiappa’s College, New College etc. and schools like Holy Angels Convent and Vidyodhaya in T. Nagar, Good Shepherd in Nungambakkam, St. Bedes in Santhome etc. A small dwarf wall of 2 ft. height should be constructed within these drains at a few points and the flow intercepted and taken at right angles to recharge wells of 5 ft. dia and 15 to 20 ft. deep (depending on the nature of the soil), located within the above mentioned public/private premises abutting them. See drawing below. Drains close to temple tanks can be straightaway discharged into the tank through a desilting/drop chamber of suitable dimensions, as has been done in Mylapore, Purasavakkam, Thiruvanmiyur and Triplicane. In all other drains, recharge wells of minimum 3 ft. dia. and 10 ft. deep can be dug in these drains itself at intervals of 30 ft. These wells should be located right below the manhole covers provided on top of the drain to enable periodic cleaning and desilting of these wells. Storm water drains running close to playgrounds and parks can also be utilized in the same way as mentioned above. It is to be noted that many parks already have large-sized dug wells, which if desilted and connected to the storm water drains, can receive huge quantities of rainwater. In places, where a storm water drain does not exist and where stagnation leading to flooding occurs, sincere efforts should be made to prevent such stagnation. Avoiding indiscriminate paving of roads and pedestrian platforms best does this. If it cannot be avoided, the one-foot strip in between the roads and the platforms should be left unpaved atleast in areas, where the soil is permeable. For example, in Besant Nagar and Valmiki Nagar, the soil is sandy and there is absolutely no stagnation in these areas. Recently, the Chennai Corporation as part of its beautification drive was involved in indiscriminate paving, which has resulted in water stagnation on roads. This ought to have been prevented. More such stagnation will result in not only flooding but also in the construction of storm water drains and end up in precious rainwater being discharged into the sea and getting wasted. In Defence Colony, Nandambakkam, the residents had constructed storm water drains in almost all the roads and connected them to a larger drain and discharged large quantities of rainwater into the Adyar river for several years. In 2001, when we were asked to explore the possibility of implementing rainwater harvesting measures in the colony, we gave a proposal to harvest the runoff water in the drains and also implemented it. The design that was adopted here, consisted of putting up recharge wells of 3 ft. dia. and 15 ft. deep within the drain in five places besides diverting the runoff water in two places to large recharge wells, of 6 ft. dia. and 15 ft. deep, located in open spaces within the colony. In three places – one in L.I.C. Colony, off Radhakrishnan Nagar in Thiruvanmiyur, second in 6th Cross street, Sastri Nagar, Adyar and the third in Greams road (in front of the Thousand Lights Police Station), stagnant water on the road was collected in a chamber located on the road and covered with a perforated lid and led to a recharge well (3 ft. dia. in the first two places and 4 ft. dia. in the third place. All the three were 15 ft. deep) located within an independent house, a flat complex and the police station respectively. These were done around two years back and have been working efficiently. The Corporation in tackling localized problems of flooding can implement such harvesting measures. Mention should also be made of the pioneering installation of such a system by M/s Alacrity Foundations Pvt. Ltd., in front of their corporate office in Thirumalai Pillai Road in T.Nagar. Stand-alone recharge wells have been constructed on the sides of roads in a few places in Kalakshetra Colony, Besant Nagar, where water would stagnate. Such wells would particularly be effective in blind streets and allays, as was done by Try Charitable Trust, in Dr. Vasudev Nagar Extn. in Thiruvanmiyur (close to 155 Division Office). The first in the above list would fit in places where storm water drains exist and the other two would be appropriate in places where there are no drains. Of course, the recharge wells constructed for harvesting the urban runoff will get silted up very soon and will have to be desilted atleast thrice a year – before the onset of the Southwest and Northeast monsoons and once during summer. If these measures are undertaken, the groundwater levels will automatically rise and confer considerable self-reliance on the residents of Chennai city. What is your experience with storm water drains in your city? Can they be used to recharge groundwater? If yes, how? Join the conversation by posting a comment below. Phone: 2461 6134 (O), 2491 8415 (R).